Hey there! Thanks for dropping by Journeying to the Goddess! Take a look around and grab the RSS feed to stay updated. See you around! “Epona’s themes are protection of animals; especially those who serve humankind. Her symbol is the horse. Epona protects the creatures who faithfully keep humans company. This pre-Roman Gaulish Goddess is nearly always shown riding or lovingly feeding a horse and accompanied by a dog – these are Her two sacred animals. Also, sometimes depicted with corn in Her lap and carrying a goblet, Epona inspires love, fertility and providence in your life. In some myths, Epona appeared to acknowledge a king’s sovereignty, giving Her leadership qualities that can help you when you need more authority in a situation. To generate a little more providence in your life, eat corn today. Say a silent prayer to Epona, asking Her to saturate your food with power, then consume it to internalize the energy. If you have a pet, consider blessing it today. To do this, find a small silver charm or a horse or a dog (like those from charm bracelets). This image invokes Epona’s protection. Alternatively, use a little bell and draw the image of a horse or dog on it. Epona was worshipped widely throughout the entire Celtic and Roman worlds, and Her worship was exceptionally strong in both Rhineland and Gaul. In fact, Epona’s worship became so strong that it spread as far away as the Danube River, Yugoslavia, North Africa and Rome. The Roman army was so impressed by Her that it eventually adopted Her cult, and the Roman soldiers introduced Epona’s worship to the many people that they encountered in their travels. The British worshipped Epona in the form of a cult, and they gave Her the title ‘Rigantona‘ or ‘Rig Antonia,’ which means ‘Great Queen.’ The Goddess Rhiannon, whose worship occurred at a much later point in time, was strongly associated with Epona, and She was known by that title as well. Epona was also known by a variety of other names, which changed according to the various languages and myths that were indigenous to each particular region. It actually matters little whether She was known as Rhiannon, Macha or Epona, because no matter which aspect She happened to appear in, Her image always remained the same. She appeared as a woman with very long hair who was riding side saddle upon a white mare. When She appeared in the aspect of Epona, however, She was depicted as a woman with very long hair, lying half-naked on a white mare. Patricia Monaghan tells us that “Epona could take the tangible forms of both parents. Sometimes, too, She appeared as a rushing river, which suggests that Epona was a fertility Goddess, often seen in Celtic culture as a water spirit. Similarly, the connection among Celtic peoples of the horse and the sun suggests a solar nature to Epona, supported as well by the patera or round sunlike plate that She carries in many sculptures. The sacred mare Epona appeared as the bestower of sovereignty in the ancient Celtic rituals of kingship, which may have included a rite of marriage with the mare Goddess. Among Indo-European peoples in India, a rite of mare-marriage, which solidified a man’s claim on the rulership of a geographical area, is attested and has been connected by scholars to the figure of Epona. Recent excavations of the magnificent British monument, the White Horse of Uffington, strongly suggests that the 360-foot-long horse represents Epona. Using a new technique, archaeologists have been studying the rate at which the hillside, upon which the White Horse is carved into the chalky soil, has descended towards the deep valley (the Vale of the White Horse) beneath. The White Horse has puzzled researchers for many years, some maintaining that it was a late medieval creation, others that it derived from the post-Celtic era. 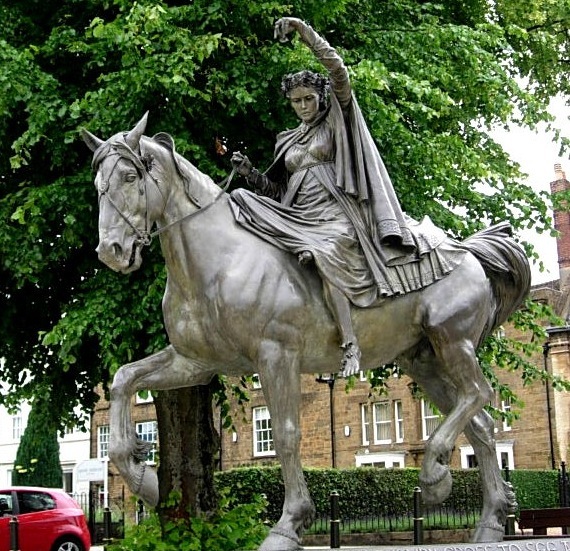 Even before the recent attempt to date the monument itself, it has been noted that the horse’s design echoed that of coins issued by the Celtic warrior Queen Boudicca. The identification of the White Horse with the Celts is now virtually certain – and as the Celts had only one horse-divinity, the likelihood is that the horse on the hill was Epona. Vestiges of Her are also found in the figure of Lady Godiva and the mysterious white-horse-riding woman of Banbury Cross” (p. 114). “Although Epona was and still is traditionally seen as a horse Goddess, She can fit into so many aspects of our lives. She is the Goddess of dreams not only of the sleeping kind but the dreams of hope and ambition. She can be helpful in manifesting dreams and is a good protector to have when venturing on a new path in life. A prayer or invocation can be offered to Her if one is having trouble sleeping or wishes to have insightful or peaceful dreams. She is a nurturing caregiver and can be called upon as a protector of families, children and women who are about to give birth. Animals Associated with: Horse, mares and foals, dog, birds. Suitable Offerings: Fruits, mare’s milk, apples, hay, sweet grass, oats, fresh water, a thick stout that you can practically chew on. Roses, rosebuds, rose garlands. Feast Days: The Autumn Equinox, when night and day are of equal length, occurs during the month of the Vine Moon; December 18 (based on the Roman calendar). Etsy.com/shop/Harmonycraft, “Epona – Celtic Horse Goddess“. A Journal of a Poet – The Goddess As My Muse, “Epona, The Gaulish Horse Goddess“. Monaghan, Patricia. The New Book of Goddesses and Heroines, “Epona”. Held, Catherine Anne. Dreamhorsewomen.wordpress.com, “Women and Horses in Mythology: Epona“. Lady Zephyr. Order of the White Moon, “Epona“. Myst, Willow. Order of the White Moon, “Epona“. Nemeton, The Sacred Grove: Home of the Celtic gods, “Epona: A Gaulish and Brythonic Goddess: Divine Horse“. Took, Thalia. The Obscure Goddess Online Directory, “Epona“. Journey and follow with me via email! Pesticide Action Network and Beyond Pesticides have partnered to protect honey bees from pesticides, and we invite you to join us. NEVER confuse HATE speech with free speech - HATE SPEECH KILLS! StopBullying.gov provides information from various government agencies on how kids, teens, young adults, parents, educators and others in the community can prevent or stop bullying. If you or someone you know is being bullied, get help. A personal journal to share my artistic works, to write about Norse shamanism and traditional paganism, European History, Archaeology, Runes, Working with the Gods and my personal experiences in Norse shamanic practices. I'm not good, I'm not nice, I'm just right. I'm the Witch. You're the world. Ancient Sacred Knowledge-Daily Wisdom Practices: A place to explore Runic relevance in today's world. A Spiritual Blog by Dipali Desai. Awaken to your true nature. Because knowledge is the key to making informed decisions for your family. The art of living with a broken heart. Exploring the intersection between Nature, the Goddess, art, and poetry as well as the practical work of priestessing.